These cards used to come with the Godzilla action figures back in the day ,found them while cleaning out my dresser they are banged up but brought back great memories. Now if only I can find and recover all the toys. A planet name Planet-X is discovered by the World Space Authority and two Astronauts are sent to investigate. When the astronauts arrive on Planet-X they see strange lightning in the sky, they soon discover that they are not alone. The astronauts are taken in by the Xiliens. The Xiliens live underground on Planet-X, they explain to the astronauts that their planet was once like Earth until it was attacked and destroyed by Monster Zero. While in the middle of explaining their history the Xiliens base is attacked by Monster Zero who we discover is actually King Ghidorah, the Xiliens just name everything by number on their plane which explains the name Monster Zero. The Xiliens manage to hold out during the attack and King Ghidorah leaves. The Xiliens then propose an offer to give the astronauts information on how to cure all disease on earth in exchange for Monsters One and Two or as they are called on earth Godzilla ,and Rodan. The Xiliens say that they want Godzilla ,and Rodan to defeat Ghidorah so that they can once again return to the surface of Planet-X. The astronauts say that they do not know where Godzilla ,and Rodan went after they battled Ghidorah last time on Earth. The Xiliens inform the astronauts that they have been watching Earth ,and Godzilla is asleep at the bottom of Lake Myojin and Rodan is located in Washigasawa. Alright this shirt was posted on Reddit today, and is supposedly available at Hot Topic I checked the Hot Topic web site and did not see it listed. If you look closely you can see Godzilla's spins in the "Zilla" portion. From what I can make out the spins are not over the top spiky which I am glad about. I prefer the more original Godzilla spins than those really spiky ones that came after 2000. I have a feeling that we will be seeing a reveal of what Godzilla will look like in the next few months. They might not shows us everything but we will have a good idea of what we are dealing with by release. This shirt is really a real cool take on the current poster for the 2014 movie. Bigger picture after the break. 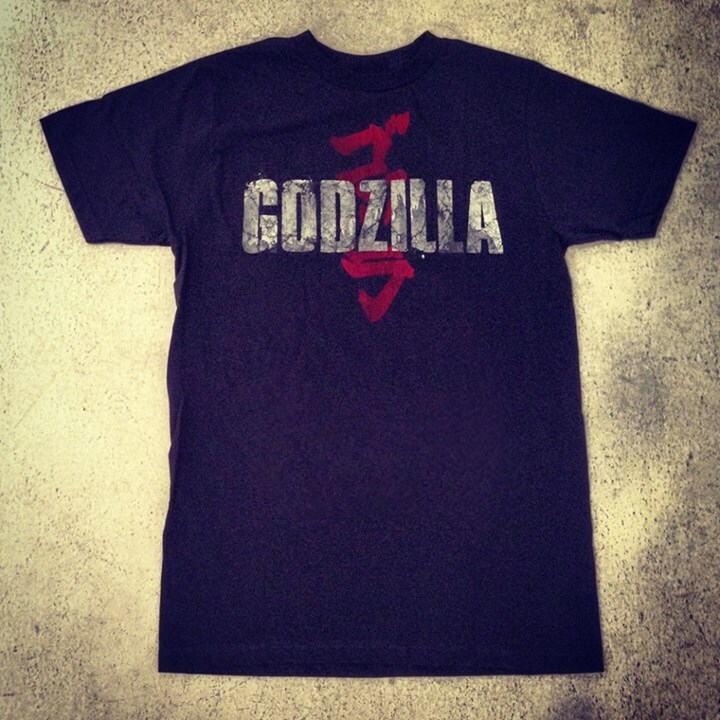 Shirt was tweeted by Legendary and also confirmed that their wil be more Godzilla coverage at SDCC. A detective is assigned to guard a visiting princess but before she arrives to Japan her plan is blown up in a bombing assassination attempt. The princess though jumps from the plan before the bomb explodes. In the mean time a meteor shower happens above japan and a large meteor crashes in the mountains. A group of scientist go to investigate the meteor ,and discover that it strangely has strong magnetic capabilities. The princess is then spotted in Japan but the detective discovers that she has lost knowledge of who she is and believes that she is an alien from Mars. The princess keeps giving warning of an impending doom coming to hurt planet earth. The princesses warning come true first Rodan thought to be dead rises from a Volcano following that Godzilla rises from the sea. The two monsters proceed to leave a path of destruction across Japan. The princess then tells the story of how Mars used to be a planet just like Earth until it was destroyed by Ghidorah. The princess further informs everyone that it is too late, Earth is doomed because Ghidorah has already arrived at earth and nothing can be done to stop it. After this happens the meteor that was being investigated by the scientist cracks open and out rises Ghidorah, the scientist then realize that the meteor was actually an egg. While all this is going on Mothra's twin fairies happened to be visiting Japan to make an appearance on a talk show. The fairies are then recruited to summon Mothra. The plan is to have Mothra unite with Godzilla and Rodan, to make them realize if they do not all of them will perish. 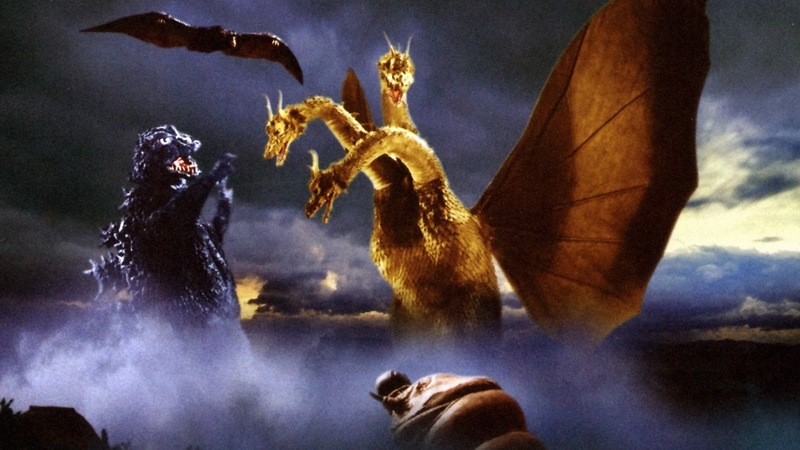 The fairies successfully summon Mothra to Japan but when Mothra arrives Godzilla and Rodan are to busy fighting each other to care about Ghidorah. After Mothra fails to persuade Godzilla and Rodan, Mothra goes off to fight Ghidorah by itself. Mothra arrives to fight Ghidorah but proves too weak to battle Ghidorah by it self as Mothra is only in its larva stage still. As it looks like the Mothra larva is about to bare witness to it's death Godzilla arrives to aide Mothra later followed by Rodan. 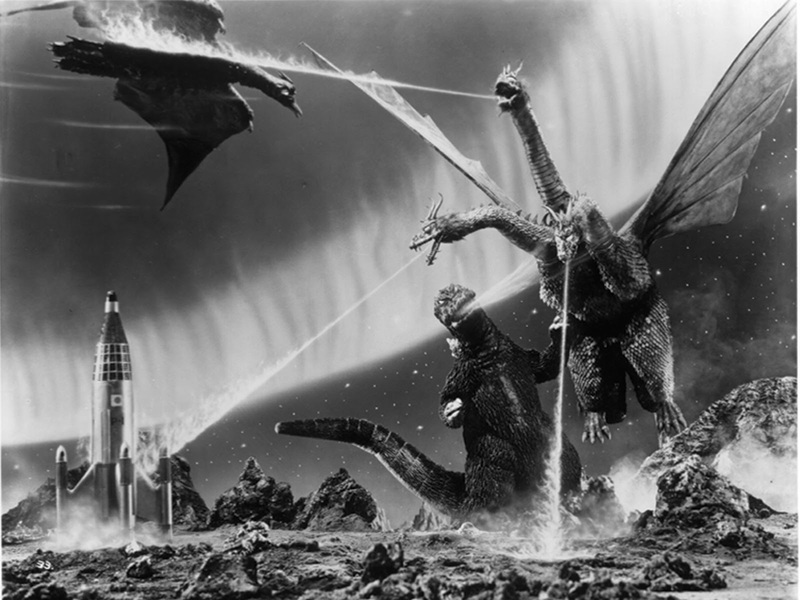 The Godzilla, Mothra, and Rodan prove to be a powerful match against Ghidorah who retreats back into space. After the success of the battle Mothra returns to Infant Island with the twin fairies, Godzilla and Rodan go their separate ways. 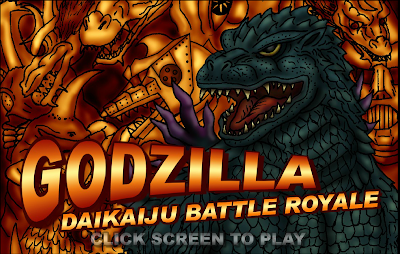 A user on reddit posted a link to this online Godzilla Flash game you can play through arcade mode and unlock every monster you can think of. It is a very fun and simple game very addictive and a great way to kill time for a Godzilla fan. Check it out here. The password to unlock all monsters is 1131954. 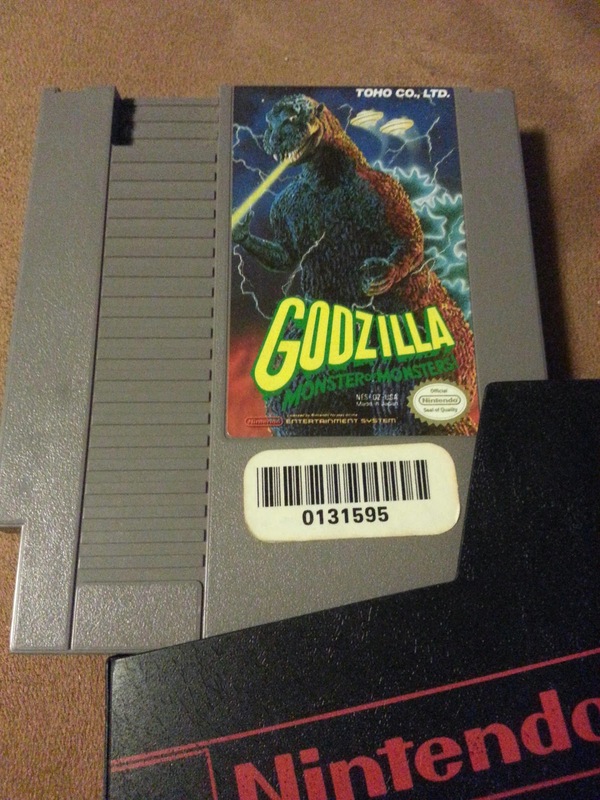 If you are a subscriber to the reddit /r/godzilla subreddit you may have seen my post of this picture yesterday. I thought you all might enjoy it. Here is a blast from the past that I still occasionally get to enjoy on my retron 3 console. 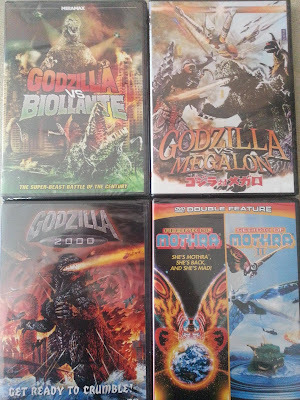 Now if only I can find Godzilla 2 for a reasonable pric. The Latest Pacific Rim Trailer Looks Like 2,500 Tons of Awesome. Here is the latest trailer for Pacific Rim. The work that Legendary has put into this film and most of their recent films has me very excited for what will come in Godzilla 2014. Embed video above courtesy of comingsoon.net. Here is a video teasing the upcoming Kaiju movie Pacific Rim. I have very high hopes for this movie and plan on seeing it the soonest I can once it hits theatres.I say soonest because I will be away on vacation next week. But be sure to check this movie in theatres next Friday July 12th if you are a Kaiju movie fan. Share your thoughts here and let me know what you think of the movie when it comes out. A Mothra egg washes a shore in Japan after a storm that ravaged Japan and Infant Island. Godzilla then rises out from under Japan and begins to reek havoc and lay waste to a Japan already hurting from the storm. A group of people travel to Infant Island to seek the help of Mothra, the island natives do not take kindly to the visitors from Japan because of the nuclear experiments Japan performed destroyed the island and the home of the natives. Mothra agrees to help stop Godzilla but Mothra is very weak and awaiting death. 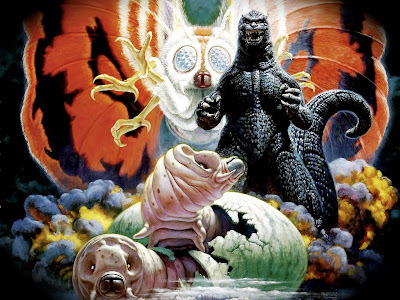 Mothra arrives just in time as Godzilla is about to destroy the egg. Mothra puts up a fight and causes trouble for Godzilla. Godzilla seems almost beat by Mothra but Godzilla unleashes his breath on Mothra which is the fatal blow that will finish Mothra. Mothra injured by the breath of Godzilla lands on its unhatched egg and dies. Godzilla continues on is path of destruction leaving Mothra's corpse and the egg behind.The egg hatches and reveals two Mothra Larva. Godzilla begins to head for an island off the coast off Japan where a group of children are stuck. The Mothra Larva take off right away after hatching and chase Godzilla to the island where the final battle takes place. The Larva cause Godzilla a ton of trouble with their web spray and end up forcing Godzilla to fall off a cliff into the sea where he retreats. Hello everyone. This blog will be a discussion blog about Godzilla and all things Kaiju related. I look forward to sharing my experiences with you all and hope to enjoy some discussions on here with fellow fans. A little background about me, my name is Frank I was born in 1989 I grew up in the 90's I started watching Godzilla movies from before I can remember, I grew up with a great love for Godzilla. 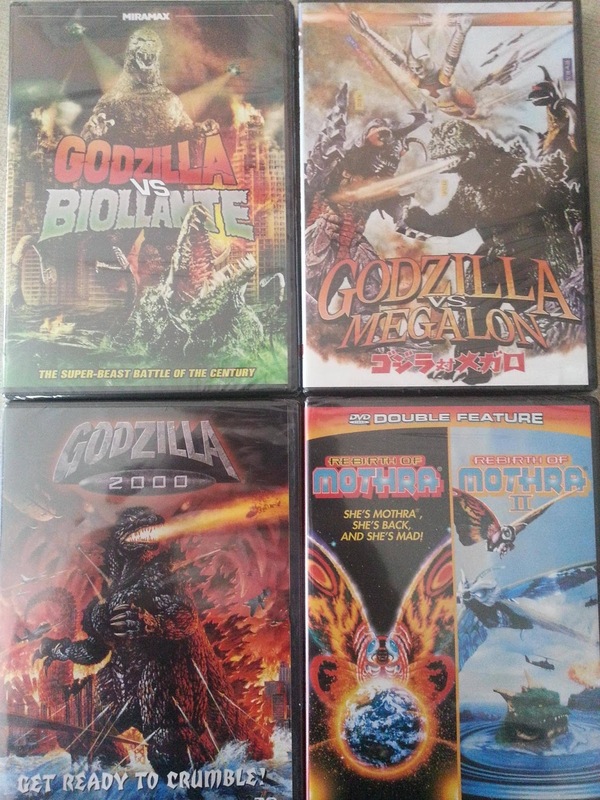 I have recently started to collect the Godzilla and kaiju movies such as Gamera on DVD, I know it is kind of late but I have stuck with my full VHS collection for years. Re-watching these movies again is something I am looking forward to. 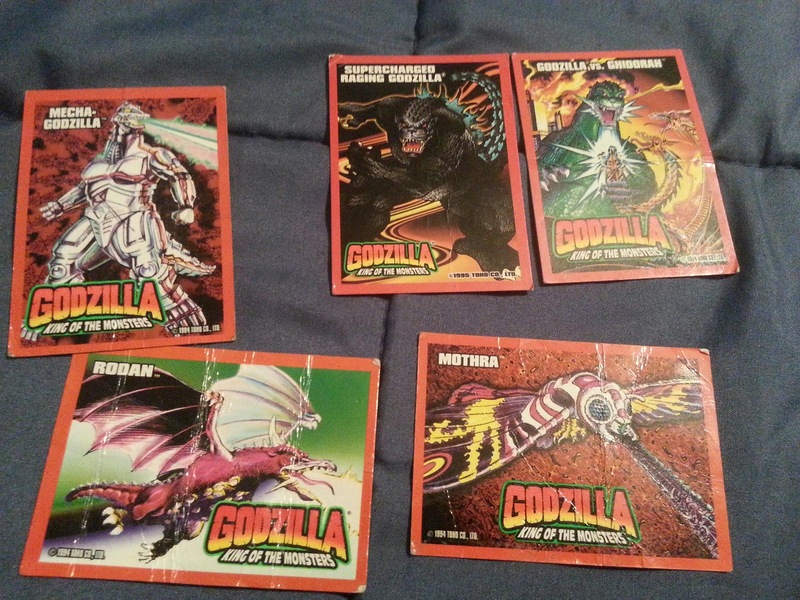 I hope some Godzilla fans find this blog and we can have some great discussions. I recently discovered the Godzilla subreddit and enjoy the talking to the fans there which have reignited my passion for Godzilla. I hope to share reviews about movies, discussions,pictures, news about upcoming Kaiju monster movies such as Pacific Rim, and Godzilla 2014. Welcome to Godzilla Island!